Be a Part of Our 2nd Annual Healing Music Festival Providing Violin Lessons to Inner City Kids in Chattanooga! Violinist, Jaime Jorge has been touring and playing the violin for almost 30 years and has done more than 3,000 concerts on 6 continents in 72 countries. In 2012 he founded Healing Music, Inc. to raise awareness and funds for missionary projects near and dear to his heart. This festival is for our project for inner city kids in Chattanooga. It provides violin lessons for those who wouldn’t otherwise be able to afford them. 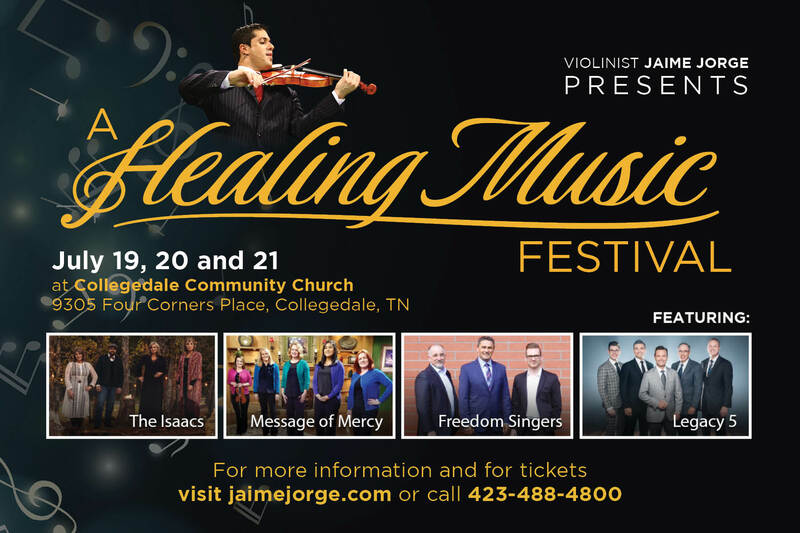 Join us for the second annual Healing Music Festival and enjoy music from some of your favorite Christian music artists. General Admission tickets $15 and doors open at 6:30 pm. Tickets purchased day of the event will be $20 and will be sold at the door only. VIP tickets $30 and doors open at 6:00 pm for early admission with meet and greet. Tickets purchased day of the event will be $40 and will be sold at the door only. Click for more info about The Isaacs. This is a FREE concert celebrating the groups 20 years of music ministry. Click for more info about Message of Mercy. VIP tickets $10 and doors open at 2:00 pm for early admission with meet and greet. VIP tickets must be purchased in advance. No tickets sold at the door. Click for more info about The Freedom Singers. General Admission tickets $10 and doors open at 7:00 pm. Tickets purchased day of the event will be $15 and will need to be purchased at the door. VIP tickets $20 and doors open at 6:30 pm for early admission with meet and greet. Tickets purchased day of the event will be $30 and will be sold at the door only. Click for more info about Legacy 5. For more information call Kim at (423) 488-4800.